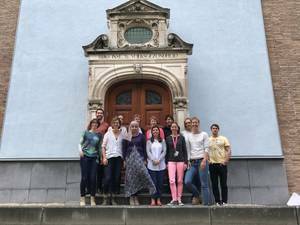 From September 13 – 15, 2017 a three day workshop on the development and standardisation of Bp-specific T-cell and B-cell ELISpot assays was held in the Netherlands. Organizer and host of the workshop was the PERISCOPE team at the Dutch National Institute for Public Health and the Environment (Rijksinstituut voor Volksgezondheid en Milieu, RIVM) in Bilthoven. Development and standardisation of Bp-specific T-cell and B-cell ELISpot assays are two major tasks within Work Package 5 of the PERISCOPE project, which require collaborative efforts from all partners involved. 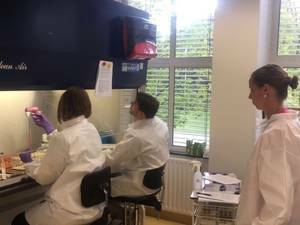 The aim of the workshop was to train the laboratory personnel from the clinical sites involved in performing the core B and T-cell assays and discuss any issues related to the standard operation procedures (SOPs), including the SOP on the peripheral blood mononuclear cells (PBMCs) isolation. 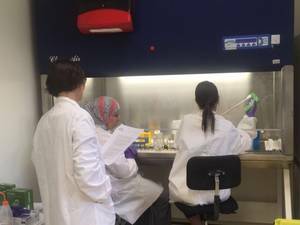 Moreover, steps to be able to harmonize the assays have been established. Laboratory workers from all clinical sites (University of Oxford, University of Southampton, University of Turku and the Medical Research Council The Gambia) and the task leaders were invited to join the workshop. Even though severe weather conditions at Amsterdam airport prevented some people from attending, the workshop was a great success and an important step towards the harmonization of the assays within the PERISCOPE Project.